Researchers at the University of Texas Southwestern Medical Center and Baylor Institute for Immunology Research have identified a novel expression signature in patients with DiGeorge Syndrome. DiGeorge Syndrome occurs because of a chromosomal deletion in 22q11.2, resulting in the hemizygous deletion of > 60 genes and 4 microRNAs. 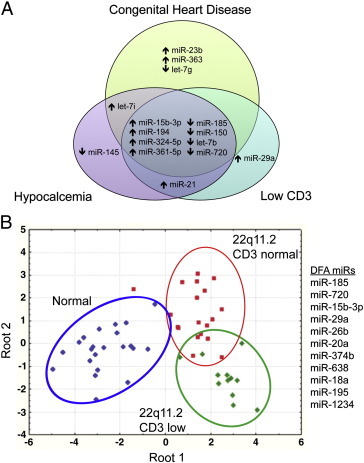 Peripheral blood taken from 31 DiGeorge Syndrome patients and 22 normal controls was analyzed for microRNA expression signatures. Van Oers’ group identified a panel of microRNA that is deregulated in the peripheral blood of DiGeorge patients as compared to controls, and in particular, miR-185 was observed to have reduced expression (<60%) in DiGeorge patients. miR-185 is a microRNA gene located within the 22q11.2 gene locus. The authors note that evaluating miR-185 expression levels in blood may be a faster and more reliable method to diagnose patients with DiGeorge Syndrome and can be used as a marker for 22q11.2 deletions. Several patients presenting with DiGeorge-like symptoms had normal expression levels of miR-185, and follow-up FISH analysis confirmed these patients had no deletion of 22q11.2. Considering DiGeorge patients can present with several different clinical symptoms, the use of association studies and mosaic cluster analyses has provided evidence for the first time that miR-185 expression can distinguish patients with true DiGeorge 22q11.2 deletions and patients with other genetic abnormalities presenting with similar symptoms. The study concludes by noting that microRNA profiling can be useful in helping researchers and clinicians identify important biomarkers for other abnormal chromosomal diseases presenting with heterogeneous symptoms like DiGeorge Syndrome.